Kindie rock artist Ben Rudnick is no stranger to the world of children’s music. Over the course of his roughly fifteen years making music for the whole family, he has released no fewer than ten total recordings. The latest of those recordings, the thirteen-track album Love Is A Superpower, was released in 2012. Now three years removed from that recording, Rudnick and company (Ben Rudnick and Friends as they are more properly called) have re-issued the group’s ’09 album A Frog Named Sam in a manner of speaking. The difference here is that this “re-issue” isn’t necessarily a re-issue in the traditional sense of the term. That is because it doesn’t just re-hash that album. Rather it lifts from each of Rudnick’s previous LPs to form what is in essence a ten track album that also includes five reprisals for a total of fifteen tracks. The end result is a collection of songs that Rudnick and company have playfully dubbed A Frog Named Sam: A Musical For Children. It can be safely assumed that such a title was playful in nature since there doesn’t seem to be any actual “movie” or presentation to which this collection of previously released songs is connected from Rudnick and company. That aside, the compilation in whole is a recording that listeners of all ages will enjoy and appreciate. The central reason for that is the lyrical makeup of the record’s featured songs. The topics presented in each of the featured songs vary from one to the next and each is equally positive and important. This will be discussed at more length shortly. Just as important to note of Rudnick’s new record is the equally varied musical makeup of each song. There is just as much variance in the songs’ musical content as there is in their lyrical content. Last but hardly least of note here is the record’s sequencing. As previously noted, the ten tracks that make up the body of this record are separated out by a series of short vignettes that reprise the introductory line from the album’s title track. If Rudnick and company should actually make a whole movie of sorts to connect to this album then those segments will work pretty well in their own right. In this setting, though they serve a different yet equally useful purpose. Together with the songs’ musical and lyrical content, those short segments round out the record and make it one that will in fact leave listeners hoping Rudnick and friends actually do make a “movie” to connect to this record. 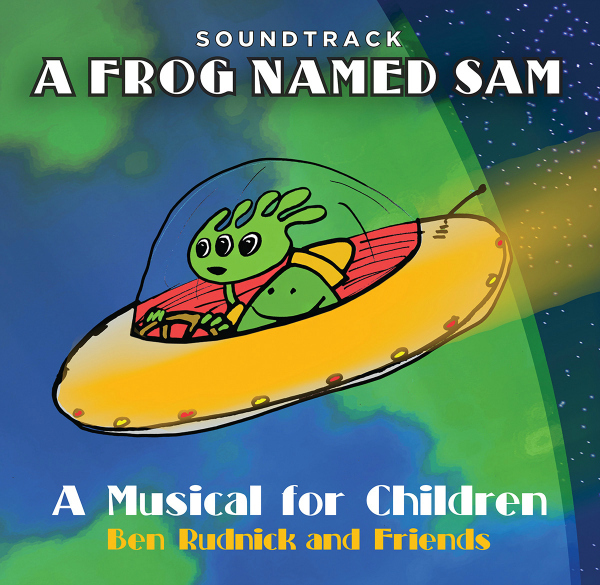 Ben Rudnick and friends’ “new” record A Frog Named Sam: A Musical For Children is an interesting new collection of songs for the veteran children’s entertainer and his fellow musicians. That is because the record is neither new nor even a traditional re-issue. Rather it presents a number of the group’s previously recorded songs in this setting for what is essentially a compilation record. Even with that being the case it is still a good introduction for those that might not be familiar with Runick’s work. That is thanks first and foremost to the lyrical content presented in each of the record’s featured songs. From a pro-literacy piece in ‘Reading a Book’ to the uplifting ‘When Something’s Got You Terribly Blue’ to the equally uplifting ‘Love Is A Superpower’ Rudnick and his fellow musicians offer plenty of reason to smile throughout this record. The latter pair of songs are both uplifting just in different ways. The first touts the benefits of having a good friend while the latter of the pair presents the power of love in every form. If those positive messages aren’t enough for fans, then the silly culinary-based song ‘Macaroni an Cheese’ and the upbeat ‘Race Car’ definitely will be. The same goes for the album’s closer ‘Coney Island Crazy.’ For those that have never had the pleasure of making the trip to one of America’s greatest theme parks, Rudnick and company paint a wonderfully vibrant picture of a trip to the park with their lyrics. The same goes for the picture painted in ‘Race Car.’ Those that have never watched a race (whether it be NASCAR, Verizon Indycar Series, F1, or other) will want to see or even attend their first race after hearing this piece. That is especially thanks to the song’s musical content. Speaking of musical content, the musical makeup of ‘Race Car’ and the record’s other songs are another reason that this new compilation is such a good introduction to Rudnick’s music. The lyrical content presented in Ben Rudnick and Friends’ new compilation is collectively plenty of reason for audiences to check out this record. The lyrical content presented throughout the record runs the gamut, ranging from mildly serious topics such as literacy and friendship to the absolutely silly as in ‘Race Car’ and ‘Macaroni and Cheese.’ While the lyrical content proves important in its own right to the record’s enjoyment, the record’s collective musical content is just as important to its overall presentation. That is because it is just as varied as the album’s lyrical content. The album’s opener is a semi-psychadelic piece that takes listeners back to the days of Frank Zappa and others. ‘Coney Island Crazy’ will impress listeners of all ages with its Chuck Berry-influenced guitar riffs. ‘Macaroni and Cheese’ is just as intriguing with its mix of old school disco and funk sounds in its main body. There’s even a touch of a reggae influence coupled with country/bluegrass at another point in the song. Needless to say the whole of those sounds will definitely keep listeners’ ears from start to finish. Speaking of that country/bluegrass mix, there is also a healthy serving of bluegrass, country, and even folk spread across the record in the Bob Dylan-esque ‘When Something’s Got You Terribly Blue,’ ‘Reading A Book,’ ‘My Horse,’ ‘I Got A New Friend,’ and ‘Race Car.’ There’s even a throwback to the 1960s and ’70s to a point in ‘The Adventure Song.’ Considering the amount of variety in the songs’ musical content there is plenty for audiences to appreciate in this element of the recording, too. Together with the variety of lyrical topics presented throughout the record, both elements work together to make this a compilation that will take listeners of all ages on a fun musical adventure from start to finish. The musical and lyrical content presented throughout the course of Ben Rudnick and Friends’ new compilation make it a record that will take listeners of all ages on a wonderful musical adventure from start to finish. Of course for all of the importance of those elements, there is still one more key element to note in this record. That last element is the collective vignettes that serve as occasional separators. There are only four of these vignettes throughout the course of the record’s thirty-two minute run time. But they still help to break up the record and keep listeners engaged. That is because they are placed with some seeming strategy throughout the record. If there were actually a movie of sorts which connected to this compilation, it would be interesting to see what the vignettes’ companion video would look like in each scene. Even without that visual aid though, it can be said that they help listeners collect themselves at specific points and in turn remain engaged right to the compilation’s up-tempo closer. In keeping listeners so well engaged, listeners will in turn agree that the reprisals are in fact just as important as the record’s overall musical and lyrical content even despite each one’s short length. Each gives just enough time for listeners to collect themselves before the next song (and set of songs) gets under way. It is just one more way in which this record proves itself an enjoyable ride through the musical universe for listeners of all ages. Together with the record’s overall musical and lyrical content, all three elements prove it to be not just an enjoyable ride through the musical universe but also one of 2015’s most intriguing children’s recordings. This entry was posted in Celebrities, Internet, Music and tagged Bartlett Ave Records, Ben Rudnick, Bob Dylan, celebrities, Chuck Berry, entertainment, F1, facebook, internet, music, NASCAR, Phils Picks, Verizon, Verizon IndyCar Series, Wordpress by philspicks. Bookmark the permalink.